2014 reissue. Kindred Spirits presents the first reissue of legendary Burkinabé vocalist and bandleader Amadou Balaké's album Bar Konon Mousso Bar, originally released in 1978 by the Ivorian label Sacodis. 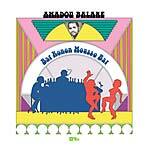 In 1978, four years after the first recorded single version of "Bar Konou Mousso," Balaké recorded that song once again, in a harder funk mode. Named "Super Bar Konon Mousso," it was an updated version of the song that had made him famous in his home country, and became the opening track on this album. The album version of this masterful ode to the penniless musicians and the ladies of African nights is faster than the more atmospheric original, fitting perfectly with the mood of the era. "Tondibama" is a traditional warba song with cheerful horn arrangements and some light backing vocals, and features effortless vocal acrobatics from Balaké. "Nabacouboury," another warba number that Balaké sang many times over throughout his long career, closes the A-side. B-side opener "Dounignamou" circles on and on, recalling a village dance, with the trumpet taking the lead vocal role by the song's end while the rhythm section cooks up a sturdy instrumental background. "Aminata, du Thé!" is one of the most powerful funk numbers to come from 1970s Africa. A true dynamite song with a hint of machismo, it leaves no doubt as to where Balaké's influences come from. Deep and hypnotic from the moment his moans and groans introduce the song, Balaké stands here at his most reminiscent of James Brown. It's all about sweat, power, and sincerity. Album closer "Balaké ya Mariama" displays Balaké's most romantic sides, as, with obvious Afro-Latin influences, he praises the grace of female hips. Balaké learned his Afro-Cubanisms all across West Africa, and it should come as no surprise that he later emerged as a world-class performer with Africando. Balaké stands as one of Africa's most mesmerizing voices, and Bar Konon Mousso Bar is a true highlight of his long career. This reissue features original artwork and remastered sound. Super Djata is one of the boldest and most exciting orchestras in the history of African modern music, if not one of Africa's greatest and most unsung ensembles. Led by the late great Zani Diabaté, Super Djata Band De Bamako stands proud as one of West Africa's fiercest orchestras, with only a handful of releases and many tremendous gigs given over the last 40 years. Born in 1947 in the Sikasso region, Zani belongs to one of Mali's most famous griot families. As a child he learned how to play the bolon, a string instrument with a bass sound, and the balafon, before learning how to dance. As a 16 year-old, he joined the Ballet National du Mali, an official dance ensemble. In the same vein as the Ensemble Instrumental du Mali, Ballet National du Mali served Modibo Keita's cultural authenticity policy in the 1960s. Zani was also taught how to play percussion by legendary Voltaic musician Amadou Ballaké in the mid-1960s. During his time at the Ballet National du Mali, he befriended fellow musician and dancer Daouda "Flani" Sangaré. Flani introduced him to his very close friend Alou Fané. Both of them came from the same region as Zani, sharing some of the same cultural references. As a trio, they joined forces together in order to set up Harmonica Jazz with Zani playing the harmonica. They moved on to the name Ganoua Band, where Zani played the guitar, Alou and Flani sang and played the kamalen ngoni while another Ballet friend, Maré Sanogo, played the djembé and other percussions. This small local outfit expanded with the arrival of three other musicians from the Ballet National du Mali. They then set up the Djata Band name in order to start one of Mali's first private orchestras. Thanks to their leader's experience, the Djata Band quickly rose to fame within the Bamako region. Despite the lack of official support, Djata Band started to record their compositions under the aegis of expert engineer Boubacar Traoré at Radio Mali's tiny recording studio. By the end of the 1970s, the band's repertoire was already very large and diverse. Their first album was released through the Discorama record label in Abidjan. Like several other Malian artists of the early 1980s, Super Djata's only outlet for their material lay in some Ivorian record company. Bringing together bambara traditions, Wasulu hunter music, Kenedugu's balafon music, and bozo fishermen dances, mandingo chants and fula repertoire, mixed with a spicy, and at times even psychedelic guitar, Zani Diabaté's Super Djata Band came to the forefront of the emerging world music scene in the early 1980s as one of Mali's strongest bands. Super Djata is one of the boldest and most exciting orchestras in the history of African modern music, if not one of Africa's greatest and most unsung ensembles. Led by the late great Zani Diabaté, Super Djata Band De Bamako stands proud as one of West Africa's fiercest orchestras, with only a handful of releases and many tremendous gigs given over the last 40 years. Born in 1947 in the Sikasso region, Zani belongs to one of Mali's most famous griot families. As a child he learned how to play the bolon, a string instrument with a bass sound, and the balafon, before learning how to dance. As a 16 year-old, he joined the Ballet National du Mali, an official dance ensemble. In the same vein as the Ensemble Instrumental du Mali, Ballet National du Mali served Modibo Keita's cultural authenticity policy in the 1960s. Zani was also taught how to play percussion by legendary Voltaic musician Amadou Ballaké in the mid-1960s. During his time at the Ballet National du Mali, he befriended fellow musician and dancer Daouda "Flani" Sangaré. Flani introduced him to his very close friend Alou Fané. Both of them came from the same region as Zani, sharing some of the same cultural references. As a trio, they joined forces together in order to set up Harmonica Jazz with Zani playing the harmonica. They moved on to the name Ganoua Band, where Zani played the guitar, Alou and Flani sang and played the kamalen ngoni while another Ballet friend, Maré Sanogo, played the djembé and other percussions. This small local outfit expanded with the arrival of three other musicians from the Ballet National du Mali. They then set up the Djata Band name in order to start one of Mali's first private orchestras. Thanks to their leader's experience, the Djata Band quickly rose to fame within the Bamako region. Despite the lack of official support, Djata Band started to record their compositions under the aegis of expert engineer Boubacar Traoré at Radio Mali's tiny recording studio. By the end of the 1970s, the band's repertoire was already very large and diverse. Their first album was released through the Discorama record label in Abidjan. Like several other Malian artists of the early 1980s, Super Djata's only outlet for their material lay in some Ivorian record company. This album was released circa 1982 on the Musique Mondiale label in Abidjan. Opening the record, "Yacouba" is a tribute to a great bambara dancer from Ballet National du Mali who was murdered in Dakar in 1973. Sober and heartfelt, Zani's guitar playing is hypnotic while Flani mourns their late friend, enhanced by eerie background vocals. Other names such as Sory Kandia Kouyaté or Bembeya Jazz's singer Demba Cambara who happened to die in Dakar the same year as Yacouba passed away are featured in the second part of the song, names which are quoted with great emotion. On stage, the whole band would kneel down at a point when playing this tribute song to the great ones who had passed away. 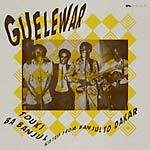 Touki Ba Banjul is a compilation of music from the Gambian psych sensation Guelewar, who played a major part in the development of the Afro Manding sound. From 1979-1982 the band released four albums, featuring some of Gambia's best funk tunes. This official, first-time-ever reissue features the highlights of their career. Before Guelewar, Laaye N'Gorn, the lead singer of the band, was already one of Gambia's most celebrated artists. He was the central figure in The Supreme Eagles, with whom he played as the main act in one of Gambia's successful clubs, The Bambo No. 1 Night Club. In return for the success, the club manager offered them instruments, after which they renamed their band Super Alligators. Due to the mixture of Western influences such as soul and funk, with traditional and regional rhythms like boogaraboo and sawrouba, Super Alligators had a unique sound. The result of this blend is known as the psychedelic sound of Gambia (Senegal). In 1973 the Super Alligators decided to rename the group Guelewar, which is Wolof for "noble warrior." After a turbulent couple of years with many musicians joining and leaving the band, Laaye managed to reform the band in order to record their first album in 1977. Over the course of the following five years, Guelewar released a total of four albums, which are all filled with deep psychedelic funk gems. Due to the limited pressings, these albums are very much sought-after by collectors. Kindred Spirits compiles the highlights of these albums, which are presented on this double LP. Touki Ba Banjul is not only a must-have for collectors of African music, but for music lovers worldwide. One of Colombia's most significant Afro-psychedelic records, capturing the country's sound system subculture of that time. Killer. In the 1970s, people on the Caribbean coast of Colombia became captivated by a host of African rhythms. Records brought in by merchant sailors from Africa became the new craze, with local sound systems becoming the main driving force behind the popularity of African music in the region. Record labels, seeing an opportunity to capitalize on this new phenomenon, began hiring local bands and creating new line-ups to cover and re-adapt these African styles into Spanish. Discos Machuca became one of the pioneering record labels to mix local Colombian rhythms with these new African styles. 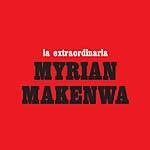 In his quest to create a record that would capture and embody the whole sound system subculture of the time, Rafael Machuca created the band Myrian Makenwa. The line-up of the band was shrouded in mystery, and in 1981, at the Discos Machuca recording studio in Barranquilla, Rafael Machuca began producing what would arguably become one of the most pulsating and innovative Afro Colombian records ever made on Colombia's Caribbean coast. He gave the musicians total creative freedom, allowing them to experiment with new sounds, mixing Afro Caribbean and Latin rhythms with elements of Afrobeat, highlife, and soukus. The result was a blistering set of raw, hypnotic grooves -- a sonic voyage, with songs like "Lady Makenwa" and "Amampondo" completely personifying the new hybrid sound Machuca was searching for. Kindred Spirits presents a compilation containing 13 rare and sought-after recordings from Burkina Faso. 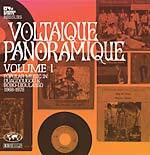 Rich and fascinating, this release comes with extensive liner-notes and an insert with photographs of the original 7" records from which Voltaique Panoramique was compiled. Until recently, not much was known about music from Burkina Faso, formerly called the Upper Volta. It is still one of West Africa's lesser-known forms of popular music. A few years before the country changed its name to Burkina Faso, thanks to Thomas Sankara's dream for a new society, voltaic music emerged as some form of true cultural revolution. Remote, poor and isolated, Burkina Faso looked to the orchestras and artists from neighboring countries such as Mali, The Ivory Coast, Ghana, Togo, and Benin. Despite the fact that the 1960s and 1970s Upper Volta lacked a proper recording studio and record pressing plant, there was a great deal of popular music produced in the country, mostly on 45s. Located at its northern border, Niger is the only other West African country whose music stayed as isolated as the music hailing from Burkina Faso. Many of its bands and artists hail mostly from Ouagadougou and Bobo-Dioulasso. They infuse some of the rich local traditions, such as mossi dances or dioula singing with Afro-Cuban flavors, American rhythm 'n' blues, French pop, and Congolese rumba. Electric guitars and organs swirl around balafon and solid horn sections. Hailing from a Boy Scout camp deep in the jungle of late 1960s Guiné-Bissau, Super Mama Djombo's founding musicians have come a long way to display their wonderful music to the world. Drummer Zé, singer Herculano, and original guitar players Gonçalo and Taborda picked the name Mama Djombo as an homage to a local goddess revered by independence fighters. Tiny Guiné Bissau is located between Senegal at its northern border and Guinée Conakry on its eastern and southern border. A former part of the mighty Mali empire, it was then one of the last African countries not to have gained its freedom from Portugal, its colonial power. Hence, a fierce war for independence struck the country, until independence was eventually won over in 1974, after many years of suffering. In the early 1970s, the Mama Djombo underground orchestra played mostly for secret political rallies supporting the PAIGC, the major Independence Movement for Guiné and Cabo Verde. Adriano Atchutchi became the bandleader after independence, bringing a book full of his songs. Atchutchi recruited singer Dulce Neves, adding Creole sweetness to its already heady mix of juvenile enthusiasm, candid melodies and touches of Luso-tropicalism. Some of their early songs were roughly recorded when the band played live over Guiné Bissau's national radio, after the country won independence in 1975. Without a proper recording studio in Bissau, the orchestra took off for Lisbon in January 1979. For less than a month, Super Mama Djombo recorded hours of music from their vast repertoire at Valentim de Carvalho studios. The production gave the band new horizons to their music, if not for the use of the Echoplex effects on the drums which added width to the production. Following the first release Na Cambança, the Festival album stands as a tribute to that large Cuban event from 1978. 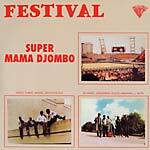 On the 10-minute title-track, Super Mama Djombo despises imperialism of any kind. It praises Amilcar Cabral and Che Guevara while keeping the beat alive with an almost spacey echo. In the same vein, "Sociedade de malandros" condemns nepotism and a "thieves' society." Made from the same mould, "Mortos nega" showcases the collective talents of the orchestra and its exceptional players. Keeping an infectious beat, the hypnotic "Tamanco" is another winner. More laid back, "Alma beafada" displays the softer side of the orchestra, showcasing the vocal talents of Chico Karuca, backed by a strong sense of collectiveness. Super Mama Djombo's saudade is highlighted on "Julia," written by guitar player Miguelinho. Tundu's eerie playing, dreamy electric guitars, hints of a frail tape loop echo and Miguelinho's mellow singing, let alone the haunting melody, make this song one the band's masterpieces. Three more albums would follow before the demise of the band in the early 1980s, due to lack of political support. The new military power in Bissau deposed president Luis Cabral, who was a strong advocate of the orchestra. Now reunited, Super Mama Djombo make up for the lost time and stand as one of West Africa's greatest orchestras. Listening to Festival is truly the best way to enjoy the music of Guiné-Bissau's musical heroes. This deluxe collector's edition comes with a heavy tip-on sleeve and is pressed on 180 gram vinyl. Limited to 500 copies. 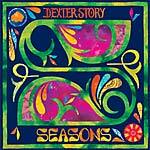 L.A. mainstay Dexter Story steps up with his debut album Seasons -- a collection of songs written by Dexter and co-produced by Carlos Niño, with guests from Los Angeles' close-knit jazz and soul community, including Miguel Atwood-Ferguson, Mark de Clive-Lowe, Dwight Trible, i_Ced, Gaby Hernandez, and many more. Progressing from their ﬁrst two records together as the Life Force Trio, 2005's Dwight Trible and The Life Force Trio on Ninja Tune and 2006's Living Room on Plug Research, the constellation of conscious themes are all there, but the sound is very different. Leaving behind the beat soundscapes from producers such as Georgia Anne Muldrow, Ras G, Madlib and Sa-Ra, for Seasons Dexter Story looks instead to artists like Bill Withers, Steely Dan, Donovan, and Earth Wind & Fire, for a record that's just as cosmically-minded, but wrapped in the folk-y, blue-eyed soul that Carlos regularly plays on his weekly Spaceways radio show. This is the second reissue from the Mali Kunkan label on Kindred Spirits. One of the rarest (that we know about) Malian records, Le Mystère Jazz de Tombouctou gets its first-ever reissue, with remastered audio and restored artwork. 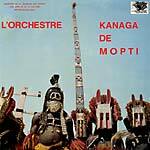 For fans of Kanaga de Mopti and the Super Djata Band. Kindred Spirits are proud to present to you this true West African gem. In 1977, the Malian government funded a series of LPs through its Mali Kunkan label. This series highlighted some of the great Malian orchestras of the period. As heard on the Kanaga De Mopti LP (KSMALI 001LP), this was a time the electric guitar was being fully embraced by the players in this West African region. The guitar is especially prominent on this record, often taking place as the central instrument next to the vocals. The album features six beautiful songs, some reaching 10 minutes in length -- all bridging the modern sounds being explored at the time with traditional rhythms and tunings. This is yet another example of the depth and beauty to be heard in the rich music from this incredible country -- past and present. Boogie & Disco Funk from the Surinamese Dance Floors '76-'83. A compilation filled with disco and boogie gems from Surinam between 1976-1983. With an estimate of 500,000 inhabitants, Surinam has a lively music scene. Although Surinam is a relatively unknown country, it has a strong influence on the Netherlands, where many Surinamese people have been living since a couple of decades ago. The music from Surinam is mainly known for its kaseko (which evolved out of the traditional Kawina music) and soul music, but the Surinamese have also been active in other genres such as pop, funk and jazz. Most Surinamese music is hard to come by, and their funk is especially rare. Because it's that rare, one often wonders how much of it has been made. The occasional funk tracks pop up on a kaseko or soul album, but full funk albums are difficult to locate. Kindred Spirits' aim is to document these lost gems: dancefloor tracks which meet the international standard of "good" dance music. While digging through these records, looking for something new, the label found a bunch of crossover tunes, resulting in this specialized boogie-funk compilation. 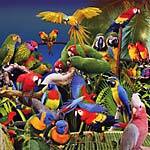 The Surinam! compilation features 10 rare tracks within the Surinamese boogie-funk genre. Key players from the '76-'83 era such as Solat, Sumy, Erwin Bouterse, Reingoud and Thunderstorm are all included. The compilation also features extensive liner notes containing in-depth information on all the artists on the compilation. This album is the first volume in the Surinam! series. The other upcoming issues will focus on the other genres of obscure Surinamese music, such as jazz and soul. New Nacho Patrol aka Legowelt. Shangaan Electro's BBC on the remix, burning it at 180 bpm! Four-track EP from the Dutch producer Mitchel van Dinther aka Jameszoo -- a perfect blend of spiritual sounds and modern experimental beat-making. This 10" contains four instrumental tunes inspired by the likes of Hermeto Pascaol, documentaries on nature and the parrot Roberto. The recordings float somewhere in the realm between spiritual jazz and modern electronic music. Special contributions from pianists Wiboud Burkens and Gideon van Gelder. Kindred Spirits drops its first 12" from their Deep Disco & Boogie series, a collection of rare and in-demand disco and boogie winners. This volume was compiled by the UK's #1 disco dealer/digger Zafar Chowdry aka Zaf aka Pussclod. The A-side features a sought-after extended mix of an ultra-rare disco track by China Burton, and on the flip you'll find the in-demand boogie cut "Set It Out" by Razzmatazz. All tracks are fully licensed and lovingly remastered from the original studio tapes. A reissue of three must-have dancefloor glisteners taken from their tough-to-find U.S. boogie LP The Exoutic Touch. The Exoutics were a group of NY-based musicians who, in the '80s, released their album on the privately-owned Dee Gee records. Now, it's an in-demand boogie rarity. The soulful lead vocals are complemented with sweet background arrangements. The vocals are closely coupled with the music, resulting in an almost playful interaction. "Limited single-sided white label of an exclusive Theo & I.G track, 'Traffic'!! You'll have heard this one if you've been paying attention to Mr Parrish's DJ sets over the past year or so." "Originally to be released on Planet E's Community Projects sub-label, this late 80's recorded vocal Brazilian Jazz gem was picked up by the Kindred Spirits camp and it was decided to co-release it with the Community Projects label. It was recorded with the New World Jazz band, which features Marcus Belgrave on trumpet, Kenny Cox on piano and Rodney Whitaker on bass a.o. Beautiful as the original is, Carl Craig decided to edit the intro, mid and outro break and add some effects to ensure that this will be a cross-over dancefloor hit on any dancefloor begging for percussive rhythms. A full album is in the pipeline." "Peven Everett, a Chicago born and raised music prodigy is most known for his collabs with Roy Davis Jr. (Gabrielle) and his Studio Confessions album on ABB/Genuine more recently. He's one of the most gifted multi-instrumentalists as well as a singer around, bringing the most soulful music today. 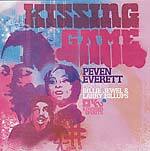 Kissing Game is based on his love for soulful house music, in true Chicago style (remember his releases for Large & Prescription with Roy Davis). 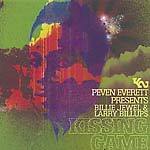 Though playing many instruments himself he brought in 2 artists; the vocal talents of Billie Jewel and Larry Billups on percussion to spice up this release. Though the main element is house music, it is a musical trip, really. From the downtempo jazz of 'The Lillie Walk' to the rap influenced 'High Life' via the musical uptempo 'Kissing Game' & 'Puerto Rico' to the more minimal old Chi house influenced 'Parrell'... its all there... to make it a perfect suitable release for Kindred Spirits once again." "Kindred Spirits continues to pay homage to Sun Ra with a 12" release of two Space Is The Place covers by I.G. Culture & crew. I.G., who goes under his special moniker Likwid Continual Space Motion Oper-Ra for this project, really outdid himself here. 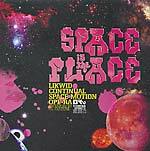 He delivers two outer space mixes of 'Space Is the Place'. Side A is a 10 minute uptempo vocal broken affair, while the B side is a 15 minute downtempo journey. Both beautiful voyages into Sun Ra's space, created with love. I.G. 's crew on this journey include: Son Of Scientist, Eska (Ma Futura), Bembe Seque, Demus and many more..."
"Peven Everett, a Chicago born and raised music prodigy is most known for his collabs with Roy Davis Jr. ('Gabrielle') and his Studio Confessions album on ABB/Genuine more recently. He's one of the most gifted multi-instrumentalists as well as a singer around, bringing the most soulful music today. On this project he works with a new singer Billie Jewel as well as percussionist Larry Billups, also both residing in Chicago. Both tracks are taking from the forthcoming Kissing Game album to be released on Kindred Spirits later this year. Both 'Kissing Game' and 'Puerto Rico' are two of the most dancefloor tracks, specially mixed and extended for dancefloor/DJ pleasure. Both super soulful, vocal tracks which will appeal to nu soul and house lovers alike." Double LP version, full color gatefold sleeve. Beautifully packaged Sun Ra tribute album, feat: Francisco Mora Catlett (w/ Marshall Allen, Carl Craig, etc. ), Jimi Tenor, Theor Parrish, Mocky, Offworld (Kirk Degiogio), King Britt, Yesterday's New Quintet (Madlib), Recloose, etc. "This year it's been 10 years since jazz legend and philosopher Sun Ra died. Therefore Kindred Spirits is releasing a dedication album and what a way to do it. Many contemporary artists / producers from different parts of the music spectrum have been asked to do a cover or inspiration. They all had one thing in common: they were heavily inspired and/or influenced by the live and music of Sun Ra. 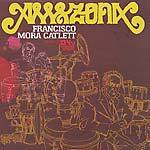 On a straight jazz tip are Francisco Mora's (drummer of Sun Ra's band, the Arkestra) Outerzone Band, Madlib's Yesterdays New Quintet (feat. Dudley Perkins) and Mocky. Jimi Tenor gives 'Love In Outta Space' a soul twist and also Kirk Degiorgio as Offworld comes with a souled out cover of 'Astro Black'. Recloose and Theo keep it slightly house and Mustang remains close to his offbeat production, while LA based Build An Ark debuts with a African vibed cover of 'Door Of The Cosmos'. King Britt pays homage to his fellow Philly musician on a hip hop tip, while Philip Charles closes off in synthesizer wonderland. We could keep on describing this, but in essence it is all jazz, an experiment, put together by many of the great musicians of today. Sun Ra lives on -- forever."